Note: This is a legacy page. The information provided on this page is obsolete because SATA has replaced PATA as the standard for hard drives. It is being retained solely for historical reasons. One of the more confusing aspects of EIDE hard drive configuration for those new to computer building is the master/slave relationship. It's actually not very hard to understand, however. 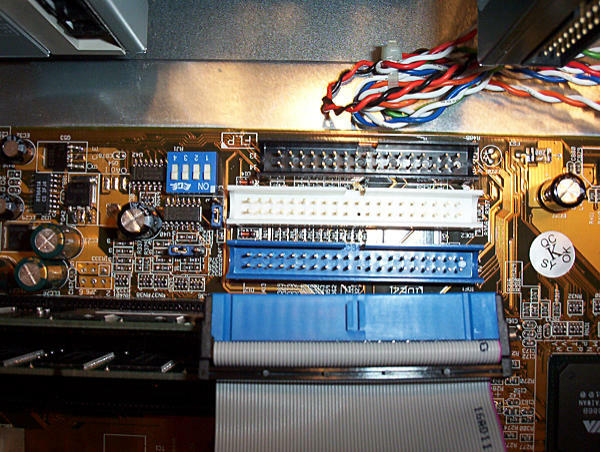 The primary EIDE connection will be labeled on the motherboard as either IDE-0 or IDE-1, depending on the mood of the person who made up the stencil. If they chose to use IDE-0 and IDE-1 for the two channels, then the primary is IDE-0. But if they are labeled IDE-1 and IDE-2, then IDE-1 is the primary. They may also be labeled as EIDE or ATAPI, rather than IDE, on some boards. It all means the same thing. Because modern IDE controllers are integrated into the drives, not mounted on the motherboard, the drives have to decide for themselves how to share the same IDE interface. To accomplish this, one drive on each interface is assigned as the "master," and the other drive (if present) is assigned as the "slave." 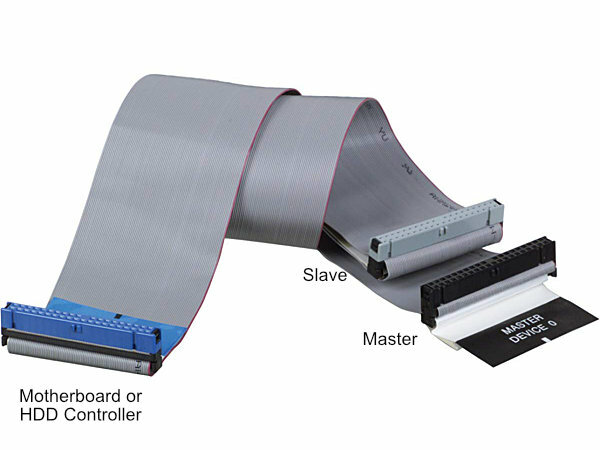 The controller on the master drive also controls data transfer in and out of the slave drive. When the master drive is idle, the slave drive may transfer data. But if the master drive is communicating with the computer, then it instructs the slave drive to wait. For practical purposes, this means that two drives that frequently write to each other should not be in a master / slave relatiohship on the same EIDE channel. Put them on different channels instead. By convention, the master drive is attached to the connector on the IDE cable that is farthest from the motherboard (that is, the one at the very end of the cable) and closest to the off-center middle connector. On an 80-conductor EIDE cable, the connectors are also color-coded: The master gets connected to the black connector, the slave to the gray, and the blue to the motherboard. Many drives also offer a "cable select" (CS) option. When using cable select, each drive is jumpered (more about this on the next page) to the "CS" setting. A special signal is sent to pin 28 of the drive attached to the master drive connector, which instructs that drive to become the master drive and to assume the duties of controlling data transfer on that EIDE channel. Conversely, because this signal is absent on the drive connected to the slave connector, that drive assumes the slave mode. Pretty smart, huh? I suggest you use the CS setting on all PATA drives. Why? Because it saves you the annoyance of having to remove existing drives to look at the little label and see how to reset the jumpers if you change the drive assignment or add a drive later on. They're not all the same. By common convention, when using IDE drives, the first partition on the master drive on the primary IDE channel contains the operating system and is called the system drive. This is not an absolute necessity, but it's the way things are usually done. When using SATA drives, the operating system is customarily installed on the first partition of the drive attached to the primary SATA controller. Once again, this is not an absolute requirement, but it's how it's generally done. Other than the system drive (which should be assigned as stated above), you have some flexibility in assigning the rest of the IDE devices. When making these decisions, the most important thing to remember is that the master and slave drives on the same IDE channel cannot both transfer data at the same time. What this means in practical terms is that data transfer between a master and and a slave drives on the same IDE channel will be slower then data transfer between drives on different IDE channels, because only one of the two drives is allowed to communicate at any given time. Therefore, you should try to avoid placing two drives on the same IDE channel if one of those drives will frequently be used to transfer data to the other. If you are a musician, for example, and you frequently copy your tracks from an IDE hard drive to your CD-RW drive, then try not to slave the CD-RW to the hard drive. Similarly, if you frequently copy CD's from a CD-ROM drive to a CD-RW drive, then try not to place those two drives on the same IDE channel. Finally, be aware that a few IDE hardware devices must be set as masters (and a very few others must be set as slaves) in order to work. Read the drive's documentation to find out if any of the devices you've selected for your homebuilt computer fall into this category.